There are many different types of buildings throughout the UK all of which were originally constructed to meet the needs of the population over the years. As times have changed, many of these buildings like horse barns, for example, are no longer needed for their intended use. In many cases, it doesn’t make much sense to tear down these older barns. Many have been made with materials that can withstand the passing of time and still have many years left in them to be put to good use. Yet they are no longer needed for the housing of horses or other livestock. To address the challenge of what to do with these barns, there have been some very innovative ideas initiated and undergone. One of these is to restore then convert some of these barns to more current and useful establishments like Hotels or other forms of accommodation. Some have been converted for the use of special venues like weddings. Being able to convert the barns into accommodations like Hotels has managed to serve many good purposes. It has allowed for the restoration of many beautiful barns that have a history to them. During their restoration, the focus has been placed on maintaining the natural ambience of this horse dwelling to keep it appealing to a tourist who visits various places throughout the UK. 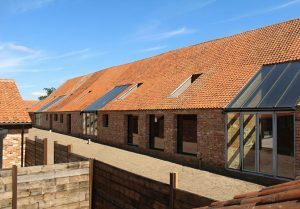 The size of these structures varies which allows those who are going to restore the barns some flexibility in the planning and design for its new use. In respect to the horse industry throughout the UK, it is still strong but horses are now being housed in more compact housing making it unnecessary to have traditional barns or the requirement for a large amount of space for the erection of traditional type barns. For those who are visiting the UK being able to make use of accommodations that consist of a converted barn makes their stay here even more interesting.